What ingredients should species-specific feed for aquarium fish contain? Considering the enormous variety of foodstuff which many species of fish find in their natural habitat, it seems impossible at first sight to meet all the different requirements in an aquarium. But however varied the individual sources and the ecological niches of the different types may be, results of much research in this field show that all these sources of food have certain ingredients in common which are vital to healthy and specific nutrition. Using this information it is now possible, for example, to produce flaked feeds which contain all the vital ingredients for one particular type of fish. 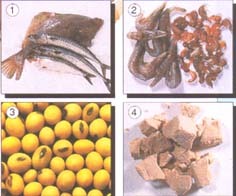 These are: proteins, lipids (fats), carbohydrates, fibres, vitamins and minerals. Proteins are the most important elements of all animal organisms. Growth cannot take place without them. Proteins consist of many amino acids, joined together like links in a chain, the order determining the function of the particular protein in the organism. Of all the amino acids known so far, 12 are considered to be vital (or essential) for fish according to today's scientific thinking. This means that these 12 amino acids must be present in sufficient quantities and in specific proportions in the protein component of the fish food. All the other amino acids needed by the fish to make their own proteins can be produced in the body from these 12 essential ingredients. The protein sources which ideally meet these requirements are primarily organisms found in water, especially fish themselves, and plant protein carriers, e.g. soya. JBL fish feed therefore contains a balanced combination of different protein sources such as fish, shrimps, soya and others. As fish, in contrast to warm blooded creatures (birds, mammals, man), need proteins not only for growth but also in part as an energy source for movement, fish food must also contain more protein than food for warm blooded pets. Particular attention should be paid to the role of fats in the feeding of fish. Fats provide fish above all with an easily accessible and highly nutritious source of energy for movement and metabolism, both of which use a great deal of energy. However, fish are not able to digest every type of fat i.e. use them as an energy source. A general rule: only those fats which are liquid at the optimum temperature required by a particular species of fish, (as a rule approx. 25?C), are suitable nourishment for that type of fish. The fats obtained from warm blooded animals, (cows, pigs etc. ), are solid at these temperatures and, if included in the feeds, would be excreted in an almost undigested state, which could lead to serious inflammation of the intestines. Fats obtained from aquatic organisms are ideal for feeding fish. They contain the so called unsaturated fats which are essential for growth, health and colouring. Some vegetable fats also contain these unsaturated fats, but in far lower quantities. By processing fish oil, shrimps and other aquatic organisms, as well as soya, JBL fish feed contains fat which ideally meets these requirements. Carbohydrates originate almost exclusively from the plant world and are characterised by sugar, starch and cellulose. With the exception of plant eating fish, starches and cellulose, because of their complex structure, can be utilised by fish very little, if at all. Simpler structures, such as glucose, can be more easily used and are useful to a certain extent as an energy source in feed. Cooking breaks down starch, and to some degree cellulose too, into its basic components making it "digestible". Starches treated in this manner, (as already described for glucose), may be utilised by fish in certain amounts. The starch content of JBL flaked feed is made more easily digestible for fish by being heated during the manufacturing process. At the same time the starch content ensures that the individual ingredients stay combined together in the typical flake form. 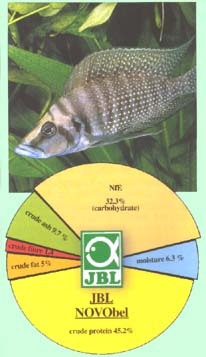 Jbl feeds contain a variety of vegetable fibres. Fibres, (mainly vegetable), have no direct nutritional value themselves but are responsible as ballast material for the correct functioning of the digestive system, as in humans too. JBL flaked feeds contain a variety of vegetable raw materials which provide the correct fibre content. The danger of incorrect feeding is far greater in an aquarium than in the wild. Therefore it is important that fish feed for aquarium fish contains all the vital ingredients in carefully balanced proportions. Vitamins are active substances which similarly have no nutritional function. They control many vital metabolic functions. For this reason vitamins are required in much lower quantities than other forms of nutrition. Lack of vitamins may, however, lead to serious and often irreversible damage to the organism. Lack of vitamins leads to duller colours as well as reduced resistance and immunity. Vitamins A and E are especially important. Vitamin A increases the body's resistance to disease, promotes growth, health and vision. Vitamin E improves fertility above all, (hence the name given to it in the past the �fertility vitamin"), and protects vitamin A and the unsaturated fats mentioned earlier against decay. Vitamin C, like vitamin A, improves resistance to infections of all kinds and builds up the body's resistance to all types of stress. JBL flaked feed uses a new kind of vitamin C which is especially stable and insensitive to heat and other influences such as light and moisture. All JBL flaked feeds contain a well-balanced multivitamin complex which meets the requirements of all aquarium fish. In addition, JBL adds Inosit to the feed. Inosit is an active ingredient similar to vitamins which counteracts fatty degeneration of the liver and stimulates growth by improving the absorption of food by the intestines. The quantity of vitamins and Inosit in the product is printed on every pack of JBL Novo feed. The inclusion of fish meal and various shellfish in all JBL flaked feeds guarantees sufficient levels of minerals in the products. Jbl Gala is especially rich in minerals due to inclusion of spirulina algae, which have also proved a valuable source of minerals in the human diet.